Pentimenti is the various degree of alterations in an artwork. The composition of the paintings that Titian worked on was extensively revised during the process to achieve the desired result. 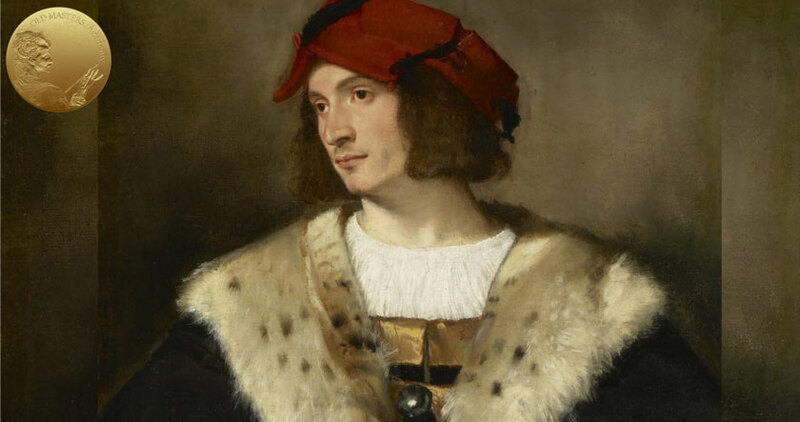 Portraits by Titian have fewer alterations, compared to multi-figure compositions. 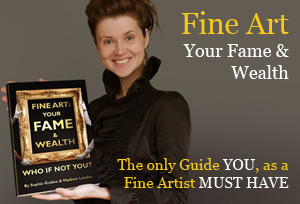 The artist was able to capture a likeness with confidence. 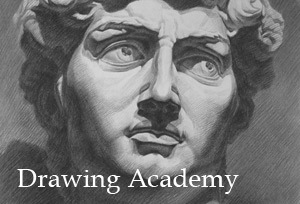 Titian often made changes to his initial drawings, and the underdrawing was only a rough guide, not a definite design. Alterations sometimes were done in a black, liquid medium, and most likely, the same medium was used for the underdrawing―for example, the lines defining the edge of the Magdalen’s sleeve in The Appearance of Christ to Mary Magdalene. 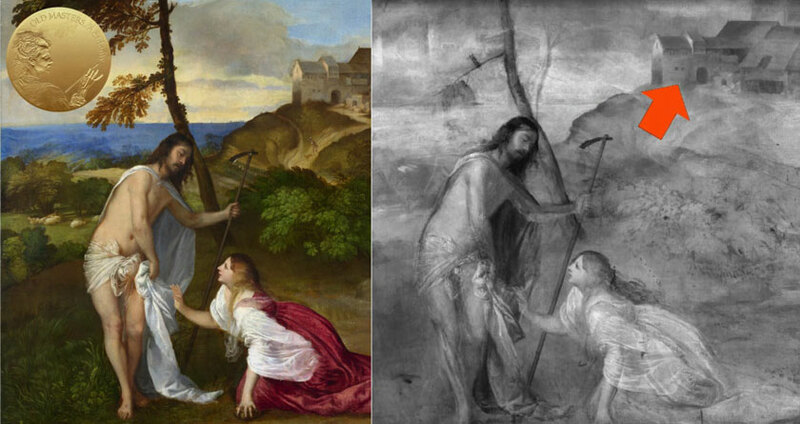 For Titian, it was usual to make radical alterations not only of form, but he also would change the colors. 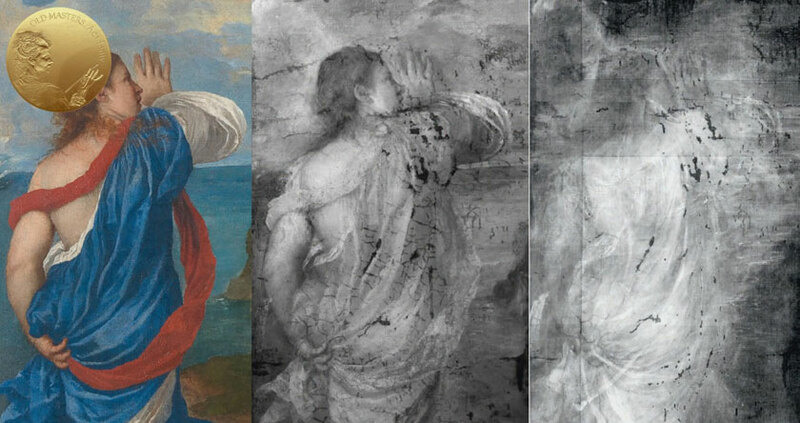 By analyzing cross-sections, we can say that Titian frequently changed his mind about colors. For example, in Bacchus and Ariadne, the skirt was over-painted from pinkish-red to blue. The Portrait of a Lady was also amended. When it was cleaned in the sixties, extensive repainting was removed, which revealed a window with a cloudy sky in the upper right corner. Initially, this window was rectangular and was changed to a large, circular opening. However, these alterations were later abandoned. 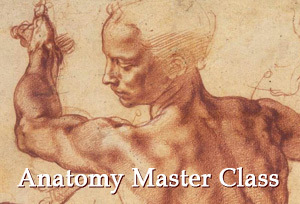 Originally, the woman’s right arm was bent, her hand with loosely clutched fingers resting at her waist. Titian later simply covered this hand with another fold of drapery. In The Appearance of Christ to Mary Magdalene, the landscape composition was changed -the hill and farm buildings were moved from the left to the right side of this artwork. The original design was overpainted with light, opaque layers of paint that covers the initial drawing. The Flight into Egypt also underwent radical alterations, as X-radiography shows. Initially, Titian painted the figures of Joseph and the Virgin kneeling in the Adoration, right in the center of the large canvas. 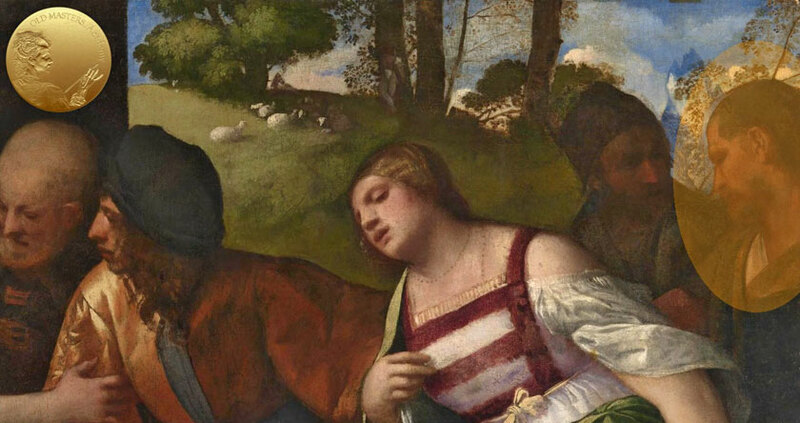 The slightly awkward composition and a naive depiction of the figures suggest that this artwork may have been done when Titian was perhaps no more than sixteen or seventeen years old. Christ and the Adulteress – one of the champions in the number of pentimenti. Let’s look at an example of this head in profile. Initially, it wasn’t meant to be there and was painted over with the sky. We can also see drying defects all over the artwork – as a result of pentimenti, that were made over layers of paint that weren’t fully dry. 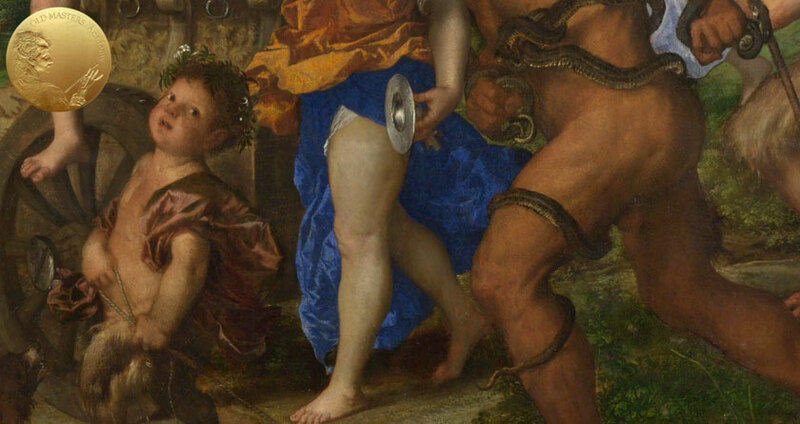 This resulted in the layer of paint cracking, which was the common trend for other works by Titian as well. The Holy Family with a Shepherd – The tilt of the Virgin’s head was changed to a different angle and also, her veil was initially painted differently. Coming back to Bacchus and Ariadne, one of Titian’s undeniable masterpieces, Ariadne’s figure went through several alterations. The infrared examination reveals that her face was shifted to the left, and her hand was moved more upright. 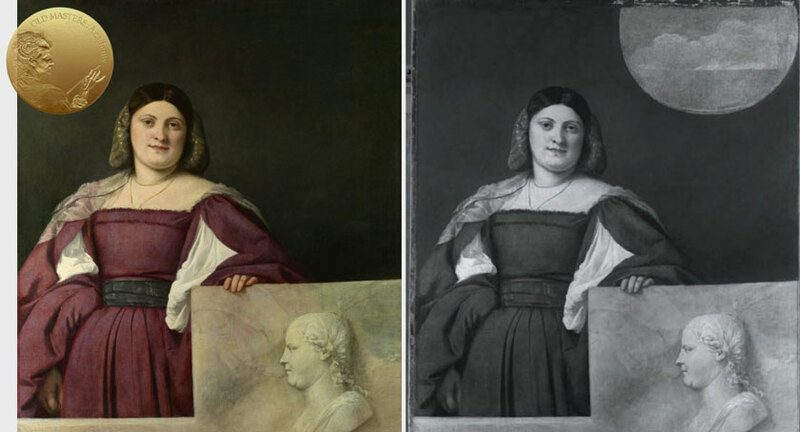 Titian also altered her back, painting it bare, and reworked her chemise and sash. After the painting was complete and delivered to the commissioner of the duke of Ferrara, Titian made other additions there on the spot. The dog was added, as well as the maroon drapery of the faun. Titian also painted yellow fabric in the left corner. These changes were done over underlying layers, which were not fully dry. This resulted in cracking of the paint.